Our polices concerning safeguarding have changed. The Parochial Church Council have adopted and are working to the new Diocesan Safeguarding Policy for Adults, Children and Young People. All our policies and associated guidance have been now been adopted, and can be viewed and downloaded from our Policies page. Please click here. Further contact information will be added to our home page in due course. In the meantime should you have any safeguarding issues please contact out our Rector, The Revd Barry Abbott on 0191 488 7397 or our Parish Safeguarding Officer Mrs Carole Dixon available through the Parish Office on 0191 488 1553. St Mary’s Church is a CoE parish within the Diocese of Durham. We are here for all the people of Whickham in a variety of ways. We are of the community, for the good of the community. We have been at the heart of Whickham for nine hundred years. We believe our Christian Faith offers hope for the world. Here you will find out who we are and what we do. As followers of Jesus we are committed to sharing our faith that all might find abundant life and blessing in the name of Jesus Christ. If you still have questions check out our contact details or visit us at the St Mary's Centre, Church Chare, Whickham, NE16 4SH Mon - Fri 9am - 12noon. 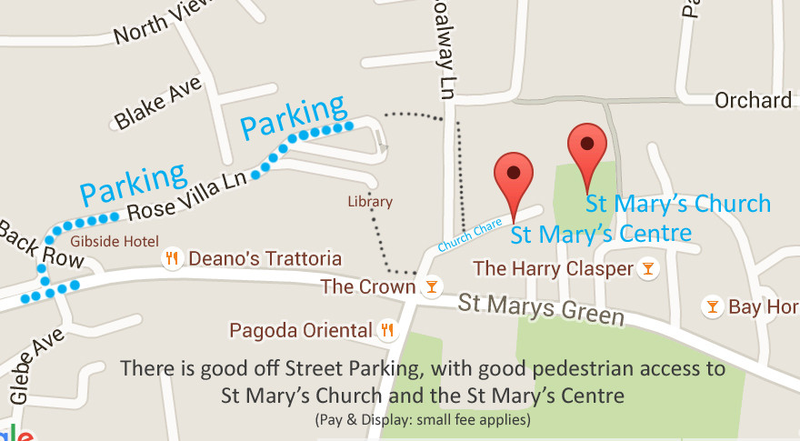 There are good car parks situated behind the Front Street shops with several paths connecting to both Front Street and Church Chare. The distance should be no more than a 5 minute walk. Please note the car parks operate on a Pay & Display basis and depending on the time of day a small charge may be required.